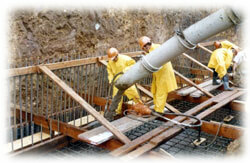 Over time pipes and tubes used to carry water, debris, or waste become blocked by residue, sediment, and concrete. This makes it difficult to flush away rainwater and after a while, these blockages can cause backflow. The cost can be high, but using water blasters to clean concrete out of blocked pipes and tubes is one way to keep backflow from occurring. Since pieces of concrete can become attached to the sides of pipes and tubes, water blasting is usually the only way to safely remove it without damaging the walls of pipes and tubes. Using water blasters to clean concrete out of blocked pipes and tubes is also less expensive than replacing sections of pipe. Once the concrete and other debris has been removed from the walls of pipes, it will need to be collected and disposed of properly. After concrete and other materials have been removed, the pipes will be able to function normally again. When using water blasters to clean concrete out of blocked pipes and tubes, a machine that uses at least 15,000psi is required to remove most debris on the walls of pipes and tubes. When using water blasting to clean concrete out of blocked pipes and tubes, it is important to prepare the area so that the debris can be disposed of in order to protect the environment. If water blasting gutters, remove the lower pipe so the runoff will fall on the ground instead of being flushed into underground water lines or cesspits. If debris is allowed to travel underground, it could become trapped in the pipeline. This could end up costing more money in repairs. Water blasting to clean concrete out of blocked pipes and tubes is only effective if it is done properly. When water blasting underground sewage pipes, make sure the debris is safely removed by sucking it out using a hose. Most companies will remove debris by collecting it in a truck and disposing it safely. Once the pipes have been cleaned, they will work more efficiently. Using water blasting to clean concrete out of blocked pipes and tubes will help pipes be able to carry away rainwater quickly and easily. Other pipes will also benefit from cleanings every few years. Depending on the soil content and the amount of concrete that is on the property, water blasting may need to be done more often in order to keep pipes and tubes clean and working properly.